Posted on January 26, 2011	by Linda D.
As we ventured further into the forest, Ghost sometimes behind me, sometimes by my side, the undergrowth changed. Prickle-bushes, red-berry bushes, small golden-nut trees and saplings gradually became more common, replacing the brambles and ferns, and the whittan trees became taller and more spaced apart. After about eight or nine miles I also became aware of a gentle thrumming pulsing through the air and ground. Ghost pricked up his ears and whinnied, but he seemed happy, and I too found the soft sounds reassuring, almost joyful. And as the hum increased I sensed that what I heard and felt was power. It drew me, led me, lured me toward it. I didn’t resist; in fact, I welcomed it for I knew I was getting closer to the monolith with every step. When eventually the bushes parted to reveal a clearing beyond I smiled and stepped through eagerly, Ghost tossing his head and mane in delight as we entered a large elliptical grassy space. I stood still at the edge of the clearing and stared at the central monolith. No wonder my grandmother had been fascinated for it was like nothing I had seen before and was certainly not what I had expected. About ten feet tall the monolith glowed with a faint light and stood within an elliptical pool of still, yet what appeared to be forever shifting, water as the shades of blues, purples and reds changed in the shimmering glow. I knew, somehow, that the structure grew out of the ground beneath and I was sure that there was more of the monolith below the earth than there was above. The edges of the pool were scarlet, bleeding colour into the grass around it whilst the monolith was of browns, greens and greys like the surrounding forest. Near the top of the structure there was what appeared to be a crescent moon resting on her back so that the tips pointed skywards. 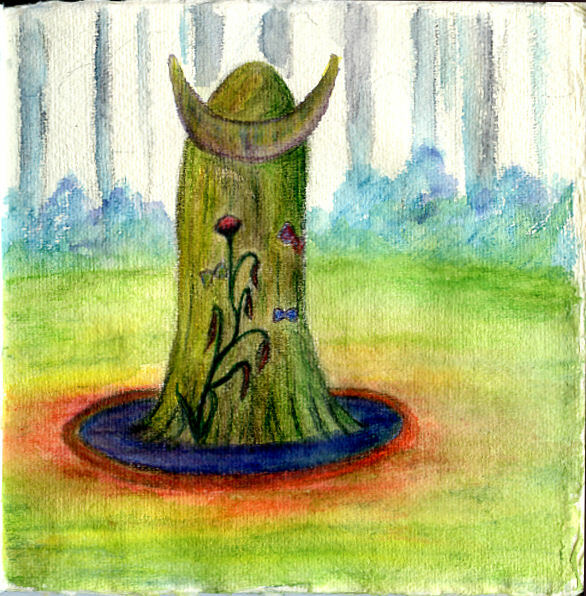 And around the monolith were engraved and painted shapes: butterflies, flowers and a sapling that grew from the base, single seeds dangling from each branch. Ghost neighed softly then began to nibble the grass within the clearing as I moved nearer to the monolith until I was almost within reach, the edge of the pool now revealed as clay tiles. Each tile was carved with butterflies, or plants, or seeds. Symbols that I guessed reflected the nature of the power that enveloped me, an energy unlike anything I had ever experienced before. It excited me, drew me nearer until only the water was between me and the monolith. The gentle hum now throbbed within me, sensuous, pulsing, urging me to step into the water to touch the surface of the monolith, to caress it and to open myself to the power. I stopped, one foot almost in the water, and stepped back, shocked and stunned that anyone else was near. But also feeling a release as the words cut the threads of power around me almost as surely as a knife. Severed from the influence of the magic I spun, searching for the speaker. At first I couldn’t see anyone and was beginning to wonder if I had imagined it, especially as Ghost, always edgy when strangers approached, still munched the grass, unperturbed. Reassured that whoever it was meant no harm, I continued to scan the surrounding forest until gentle laughter broke from the outskirts of the clearing. Frowning, I looked toward the sound. Still I saw no-one, until the bushes parted and a small, slightly-built character cloaked in a garment that blended with the undergrowth behind him stepped into the clearing. He strode toward me, pushing back his hood as he did so to reveal a tanned wrinkled face framed by pale lavender hair. Long wild hair that tumbled about his shoulders. Shay! I gasped. I had never expected any Shay, not here, not in Whittan Forest. For surely all had long since gone?